24th Avenue W. and Sheyenne Street intersection is closed to access Sheyenne Street. Traffic shifted to the east side of the roadway between the Sheyenne Diversion channel bridge to 26th Avenue W. intersection. 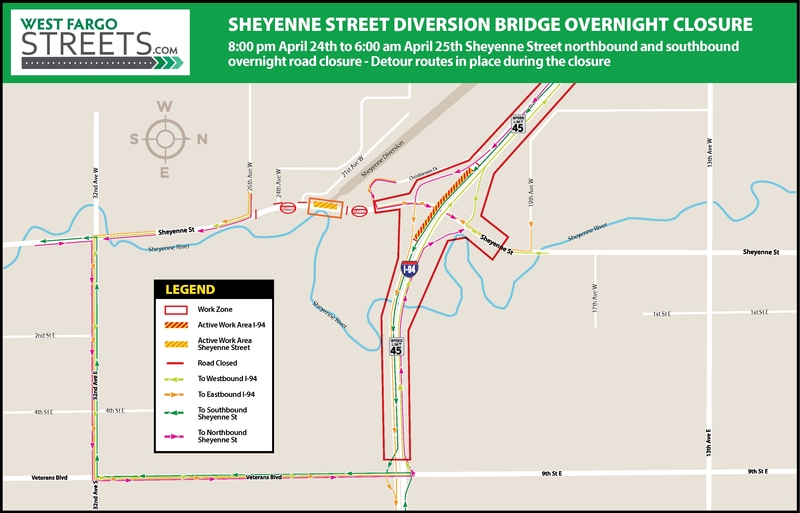 OVERNIGHT CLOSURE: An overnight road closure is scheduled for the Sheyenne Diversion Channel Bridge Wednesday, April 24. Crews will close Sheyenne Street at 8 p.m. to all traffic between 26th and 21st Avenues W. until 6 a.m. Thursday, April 25, to safely complete a bridge deck pour. The road closure is necessary because oversized equipment will be placed on Sheyenne Street to pour the new southbound diversion channel bridge deck. By the early morning rush hour Thursday, both directions of Sheyenne Street will be open to drivers in this stretch and the current work zone traffic patterns will resume. Reduced Lanes: 32nd Avenue W. intersection traffic will shift to the north side with one lane in each direction. Crews will begin the remaining underground and installation of permanent traffic signals in the southeast and southwest quadrants. Local access will continue to use 32nd Avenue W. and Sheyenne Street intersection to travel south to side streets.